Chrissy Teigen, John Legend, two-year-old Luna and three-month-old Miles have popped off to Bali for a family holiday and CT has been regaling her social media followers with tropical updates. One particular update caught the attention of many squeamish fans. 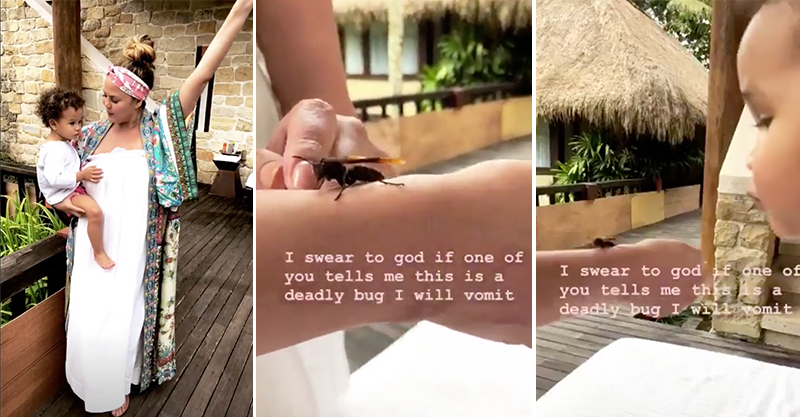 “Time for another game of what’s that bug,” Chrissy posted alongside a clip of a winged bug crawling up her arm as daughter Luna watches on in delight. She asks a transfixed Luna whether it was a “nice” bug and wonders “do you want to give him a kiss?” which Luna does several times – from afar. “I swear to god if one of you tells me this is a deadly bug I will vomit,” she elaborated in some text across the clip. And guess what? Twitter DID tell her it was a deadly bug. They told her over and over. 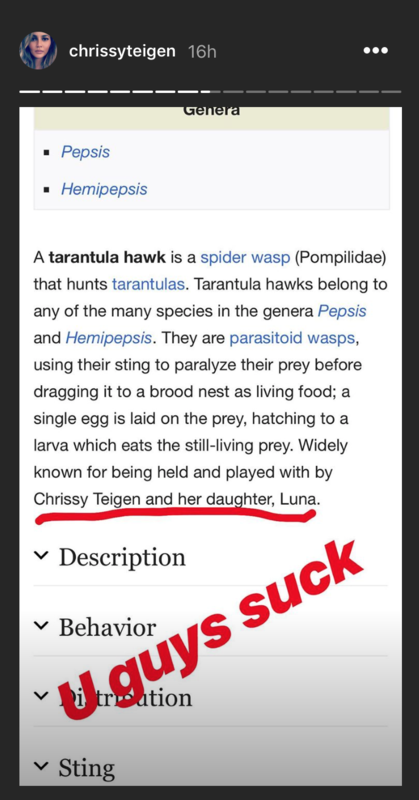 Not only did they tell her, they identified the bug as a pretty dangerous one AND whipped over to Wikipedia to update the bug’s page to reflect its playtime with Luna and Chrissy. At this point the story arced wildly, taking Twitter on an edge-of-seat ride dripping with fear, friendship and furry bug legs. “I think I just gently played with a hornet,” Chrissy posted. When fans pointed out she’d been cosy-ing up to a Tarantula Hawk Wasp, the mum-of-two was SHOOK. “Oh my god but he was so nice,” she tweeted. “Guys I think he is one of the good ones.” She later noted that the bug seemed a little peaky, too. Pondering her handling of a bug that is apparently capable of wreaking havoc on the entire world, she wondered if she might be … gifted. Too late, she realised that she was due for a bloody good “bug shaming” from the trolls of Twitter. She braced herself. But then? PLOT TWIST! Some experts weighed in. They were keen to a) identify the bug as not a terrible doomsday type buggy and b) save Chrissy from the scantibuggy mummy shaming haters. “Pretty sure that’s a large paper wasp, Polistes Tenebricosus maybe? Definitely not a hornet. Still a wasp though,” one science-y type posted. Then they came back a little later. Indeed, The Washington Post dug deeper into this compelling story noting that while the nice bug was not the best playmate, the paper wasp probably, maybe wouldn’t have wanted to hurt Chrissy or Luna. “They can sting, although their fiercest behaviour is reserved for defending their nests,” educational outreach coordinator for the Purdue Department of Entomology, Gwen Pearson told the Post. Chrissy seemed thrilled with this turn of events, and noted that the non-badass bug status didn’t make her like the bug any less.